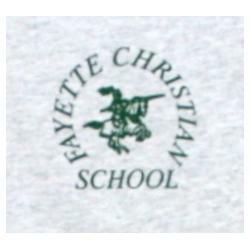 Even though Christians differ in what is considered "modest," FCS has carefully chosen garments that we feel would best suit the needs of the school. Students must wear uniforms to school beginning in 1st grade. Preschool and Kindergarten (K3, K4, and K5) are not required to wear uniforms. Please see the Student Handbooks for uniform details for high school students. A. Kindergarten students are not required to wear uniforms; however, modest (knee length) dresses, skirts, or pants are required for the girls; pants and shirts for the boys. Kindergarten students are permitted to wear shorts when appropriate for the weather conditions. Please follow the guideline of modesty (knee length) for shorts, as well. B. The length of all skirts and jumpers must be no higher than the top of the knee. When wearing shorts underneath skirts, the shorts may not be longer than the skirts. Shorts should not be seen hanging out from underneath the skirt. C. Skorts and capris do not comply with the current dress code standard (grades 1 through 6). 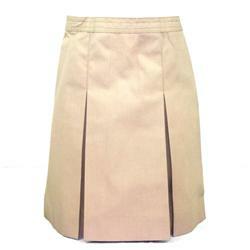 D. All pants and skirts must be from a school uniform line (grades 1 through 6). 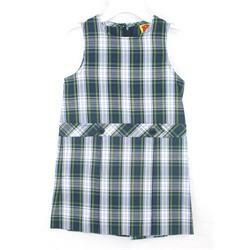 1) Navy or Khaki skirt or jumper and school plaid (purchased only through Educational Apparel) skirt or jumper. Oxford cloth shirts or blouses are also acceptable in light blue, white, or yellow. 5) Navy, light blue, yellow, white, or hunter green crew, v-neck or cardigan uniform sweater or sweater vest. A uniform shirt must be worn underneath all uniform sweaters or school sweatshirts. 6) Shoes: tennis shoes, loafer, or dress shoes are acceptable during the school day. However, tennis shoes are not permitted for school programs. Socks, tights, or hose are required with all shoes except sandals (weather permitting). 7) Girls are encouraged to wear shorts under their skirts and jumpers. In cooler weather, girls may wear tights or leggings under their skirts and jumpers. Leggings and tights must be white, navy, black, gray, or hunter green. Leggings and tights may not be worn alone in place of pants. 8) All camis must be tucked in and must be the color of the shirt you are wearing. 9) Girls may wear jewelry that is neither excessive nor distracting. Girls may have their ear lobes pierced; however, no other body piercings are permitted. Tattoos, either permanent or temporary, are not permitted. 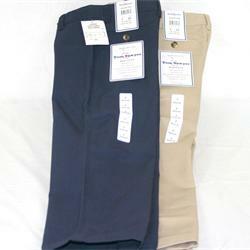 1) Navy or Khaki pants (no corduroy or cargo pants). 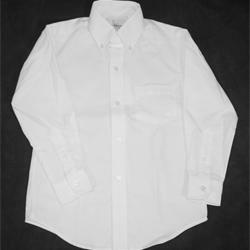 Oxford cloth shirts may also be worn in the light blue, yellow or white. 3) School sweatshirt or any plain school-colored sweatshirt. 4) Navy, light blue, yellow, white or hunter green crew, v-neck or cardigan uniform sweaters or sweater vest. 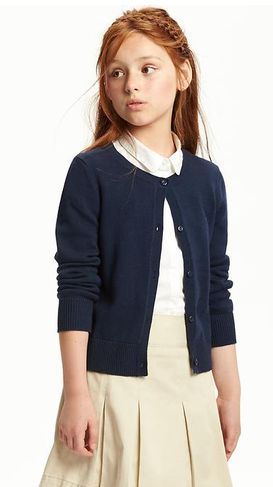 A uniform shirt must be worn underneath all uniform sweaters or school sweatshirts. 5) Brown, black or navy belt. 6) Shoes: tennis shoes, loafer, or dress shoes are acceptable during the school day. However, tennis shoes will not be permitted for school programs. Socks are required to be worn with all shoes. 7) Male students must wear their hair off the ears, collar and eyebrows. 8) Male students may wear hand or wrist jewelry of good taste. Necklaces, body piercing, and tattoos of any kind are not permitted. 9) All shirts must be tucked in. All students in grades 1 through 6 are required to have a P.E. uniform consisting of pants and a school T-shirt. 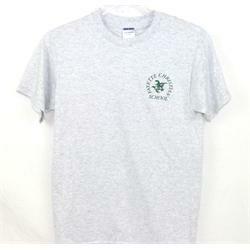 Any FCS school t-shirt may be worn for P.E. The pants are to be school green (hunter) or black. School green or black shorts are optional. The shorts must come to the top of the knee when standing and pants must be loose fitting. The shirt may be purchased from Craigs or Educational Apparel. 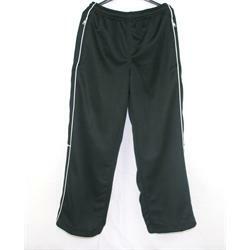 The shorts or pants may be purchased at Craig's, Educational Apparel, or elsewhere, as long as they are a solid school green or black, white stripes down the side are permitted (no labels, snaps, zippers, etc.). 1st through 6th grade students will wear their P.E. 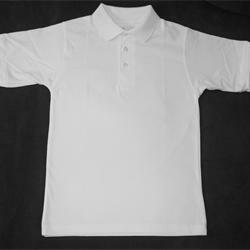 uniform to school on their designated P.E. day.